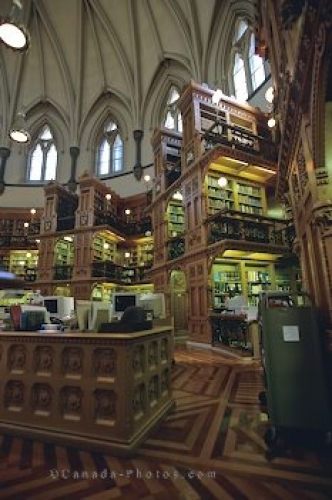 High shelves filled with books line the outside walls inside the old library at the Parliament Building in Ottawa, Ontario. The design of the old library at the Parliament buildings in Ottawa, Ontario is adorned in the High Victorian Gothic Revival architecture and this historic building has been around for 130 years. The flooring, the high book shelves, the domed roof and the art creations take hold of you when you enter the library and then there is still the expansive collection of books to explore. Library, Parliament Building, Ottawa, Ontario,Canada,North America. Picture of the interior of the old library at the Parliament Building in Ottawa, Ontario in Canada.